For 2012, WWF’s Pandamonium challenged leading contemporary minds from the art, fashion and design worlds to create wearable sculpture to celebrate and support 50 years of WWF. There was an exclusive opportunity to purchase some of the specially commissioned artworks in a silent auction to help raise funds for WWF’s vital work to safeguard the natural world. Working in collaboration with Sian Evans we created The Temple Tip Bower. This creature is a forest dweller from an apocalyptic future who gathers remnants from a distant past creating a ‘Newtopian’ present. 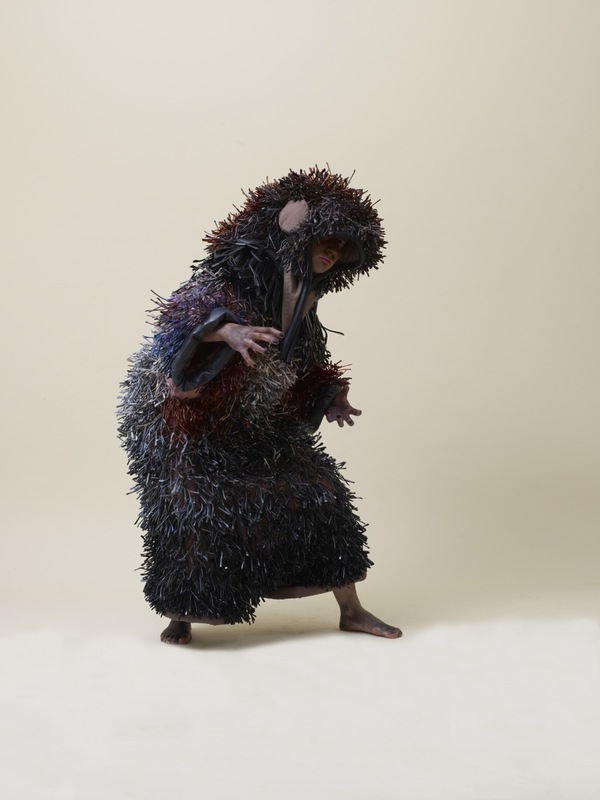 In a similar way to the Bower bird, this creature obsessively collects one specific object. In this case the creature gathers and utilizes found Temple Tips from salvaged spectacles and has created a wearable garment providing warmth and protection. This is a reminder that materials discarded by one person can be life-saving to another. Material – Artists canvas, cold water dye, string, customized safety pins & temple tips from found spectacles.